I spent a couple of hours walking around the path, taking photos at our monitoring sites. We usually take the photos in October, so the bushland is much dryer now than usual, but even so, it looks dramatically different. Signs of life are returning to the bushland - this Banksia is putting out new shoots. Notice the damage to the bark from the hail stones! Most Jarrah trees are shooting as well. 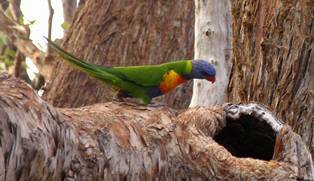 The Rainbow Lorikeets are back as noisily as ever. I heard a few wattle birds and some honey eaters, but the bushland is still very quiet.